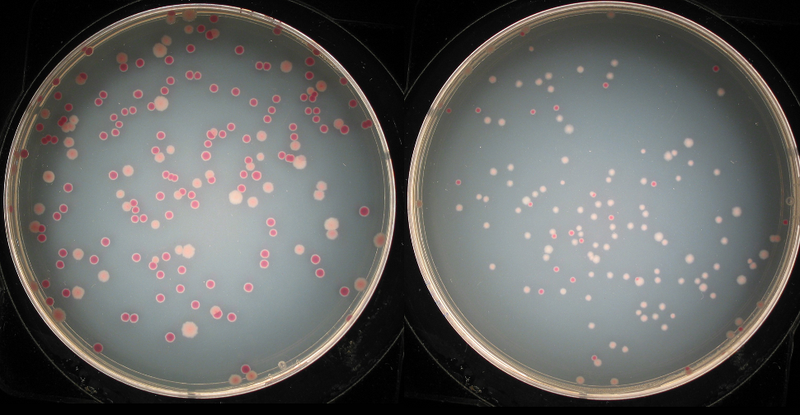 In a remarkable experiment that's been going on for nearly a quarter century, biologists have shown that lab-grown bacteria — even in a stable, unchanging world — will continue to evolve in a way that makes it increasingly good at reproducing. Back in 1988, evolutionary biologist Richard Lenski took some E. coli bacteria and put them in a dozen glass flasks. These 12 populations of bacteria have been there ever since, eating and dividing in isolation — over and over and over again. Now, some 25 years and 50,000 generations later, the strain has demonstrated some very noticeable changes. What he and his colleagues at Michigan State University in East Lansing discovered was that, even in the static, boring lab flask, the bacteria never stopped evolving. On it's own this may not sound surprising. Evolutionary theory would suggest that, even in the absence of any kind of selectional pressures, genes will slowly drift and degrade over time; there's very little to reinforce the integrity of genetic traits outside of basic biological functions, like replication. But computer models have shown that animals can still experience significant evolutionary changes over time, even in the absence of selectional pressures. Traits like evolvability, or evolutionary potential. Can evolution still happen without competition? Indeed, the Lenski study shows that the same holds true when working with organisms in evolutionary "real time." The researchers, who performed a comparative analyses of the bacteria after every 500 generations, showed that E. coli will continue to evolve towards increasing replicative efficiency. In other words, it got faster and faster at reproducing. And remarkably, the bacteria showed very little signs of slowing down. Indeed, after 10,000 generations, Lenski thought the bacteria would reach an upper limit beyond which improvement was impossible. But now, at the 50,000 generation mark, it's still getting better. Random mutations have allowed the microbes to get increasingly "fitter," giving them an advantage when competing with those that reproduce more slowly. So it's not entirely true that the bacteria is in isolation; it's competing with itself. The original strain of E. coli took about an hour to double its population. But the new strain can do it in around 40 minutes. Lenski's team calculates that future generations will reproduce even faster, predicting that in about a million years their doubling time could be on the order of about 20 minutes. The researchers observed that the mathematical pattern matched a power law; the bacteria will continue to improve for as long as the laws of physics will allow, but at an increasingly diminished pace. This study also suggests that evolution never reaches a pinnacle of perfection, or a static fitness peak. There's always room for improvement. It's impossible to know if the same effect applies to other organisms, particularly non-microbial ones, but Lenski's team believes that similar patterns would likely apply. It's doubtful that Lenski's experiment will last for the next million years, but he's hoping to keep it going for another 25 years.